These adventure flight takes you over the Türnitzer Alps, the Tirolerkogel and Mariazell. Also over the Graualm and the Styrian Seeberg right up to the mightiest mountain in the Lower Austria and Styria border, the 2277 m Hochschwab. 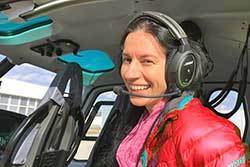 You experience a breathtaking insight, the so-called ring along the Hochschwabmassiv you can see in example marmots and chamois.The return flight via the newly built Schiestlhaus, Zell Staritzen and the Erlaufsee, Gemeindealpe and Ötscher back to the heliport in Kilb. The flight time is approx. 65 minutes.